Who doesn't love a game of BINGO? Guests will enjoy playing this fun interactive party game. 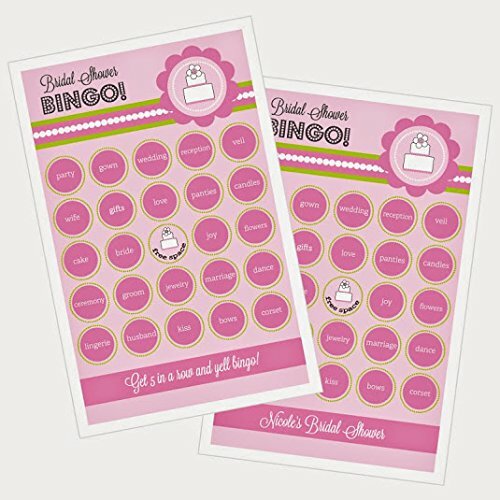 These Pink Cake Party Theme Bingo Cards are pre-printed with common cake related words, each card is unique - no 2 are alike! A word list is also provided, just tear out the cards, drop them in a bowl and draw at random. First person to get 5 in a row yells BINGO! Middle square is a free space on all cards. Guests can use a pen to cross off called bingo words OR you can provide them with creative bingo markers like life savers or chocolate kisses (markers not included). **Each card in each set that is unique. If you have any questions about this product by Eventblossom, contact us by completing and submitting the form below. If you are looking for a specif part number, please include it with your message.